This is a listing for a 1-inch button badge. It's for all those people that have a very severe dislike for that small green vegetable that is popular at Christmas. Those pesky Brussel Sprouts! Are you someone that hates them? We think this is such an epic Christmas Badge. 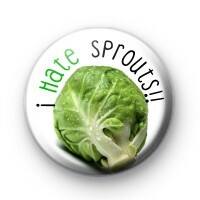 If you know someone that loves sprouts then we have that badge too! Whether you love or hate this green vegetable we have the badge for you this Christmas.